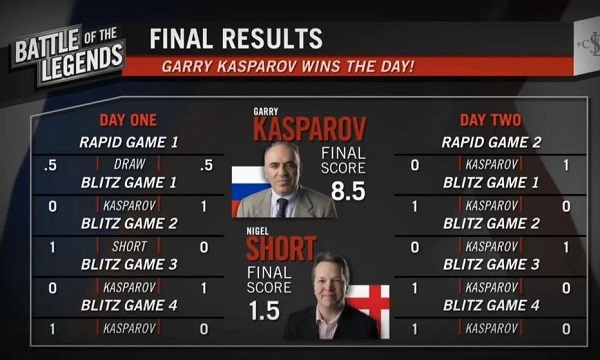 Garry Kasparov mercilessly crushed his old rival Nigel Short on the second day of the Battle of the Legends in St. Louis. He racked up five consecutive wins with hyper-aggressive chess that both overwhelmed his English opponent and reminded the watching world of just what we've been missing for the last ten years. We take a look at the games, including the day's opening rapid encounter, where Short was still able to trade blows with the "Beast from Baku". 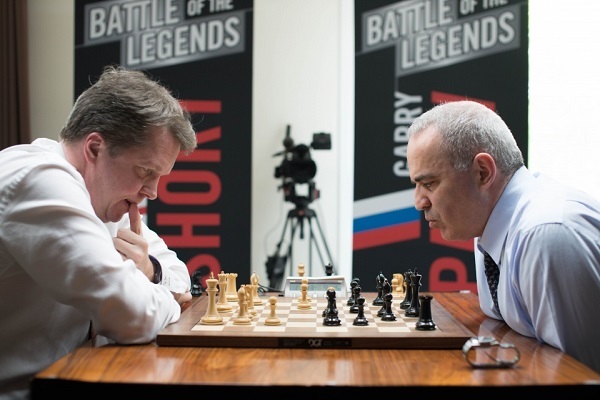 Eight wins, a draw from a very promising position and a needless loss on time in a good position is the final reckoning of Garry Kasparov's couple of days in St. Louis... Although Short also spoiled some good positions the final result against a strong opponent provokes an obvious question: what is Kasparov's current strength? 1. e4 c5 2. ♘f3 d6 3. d4 cxd4 4. ♘xd4 ♘f6 5. ♘c3 a6 It's always a pleasure to see the greatest player of all time play his favourite opening, the Najdorf Variation of the Sicilian Defence. 6. g3 Short opts for the fianchetto variation, which usually leads to more positional territory than the main lines with Bg5 or Be3. 6... e5 7. ♘b3 ♘bd7 8. a4 b6 This has the aim both of developing the bishop to b7 and also preventing White from fixing the queenside structure with a5, since that could now be met by b5, with capturing en passant no longer a legal move. 9. ♗g2 ♗b7 10. O-O ♗e7 11. ♖e1 ♖c8 12. ♘d2 Up to this point both players have been following known theory for this variation. The knight wants to make it to d5 via f1-e3. Kasparov now springs a surprise with an interesting novelty. 12... ♖c5 was the recognised move, but after 13. ♘f1 ♕a8 , putting pressure on e4, Black has problems equalising if White sacrifices that pawn: 14. ♘e3 ♘xe4 15. ♘xe4 ♗xe4 16. ♗xe4 ♕xe4 17. b3 Ba3 will follow, with the knight jumping to d5. White has fantastic compensation and a better position. 13. ♘f1 Nigel continues with his plan. 13... h4 14. ♘e3 g6 Preventing a jump to f5. 15. ♖e2 Preparing to jump to d5 and be able to take with the queen in case all of the pieces are exchanged. That wouldn't be possible immediately since the c2-pawn would be left hanging. 15... hxg3 16. hxg3 ♖xc3! The trademark Sicilian exchange sacrifice! 17. bxc3 ♘xe4 Kasparov gains a pawn for the exchange along with good squares for his pieces, but it won't be easy to demolish the still very solid white position. 18. ♗b2 ♘df6 19. c4! Fighting once more for the key d5-square and also rejuvenating the b2-bishop. 19... ♕c8 20. ♘d5 ♘xd5 21. cxd5 ♘g5⁉ A move criticised by computers, but the correct one in a game between humans with little time for either player! Garry seeks the maximum activity for his pieces against the enemy king. 22. c4! Short stays calm and increases his advantage on the queenside. 22... a5 Garry was proud of this quiet positional move, which has both the idea of activating the bishop via a6 and preventing an a5-break by White. 22... ♕xc4 23. ♖c2 wins immediately for White, since if the queen moves to its only free square 23... ♕b4 it gets hit by 24. ♗a3 and White always has ideas with Rc7 or Rc8 in reserve. 23. ♖c1 ♗a6 24. ♕b3 Hitting b6. White has managed to threaten the black structure on the queenside, but Kasparov doesn't let trifles like that bother him! 24... ♕g4! He counterattacks on the kingside. 25. ♖cc2 It was more natural to play Re3, in order to remove the e2-rook from the attack, but Short wants to overprotect the second rank in order to be able to carry out the idea we see in the coming moves. 25... ♗c8! Garry brings the light-squared bishop to join the party. It threatens both to come to f5 immediately and also some future ideas with Bh3. 26. f4! Short doesn't cower in defence but hits back in the centre! A great exchange of blows! White wants to open up the centre so that the black king will no longer feel safe on e8, though of course this also weakens the white king position. 26... ♘h3+ 27. ♔f1 f6 Trying to shore up the centre - this was the other positional move Kasparov was happy with after the match. 28. ♕f3! Nigel is defending brilliantly. The queen exchange would alleviate the pressure on the white king position, so Garry avoids it for now. 28... ♕f5 The situation is very tense since White seems to have the kingside under control but doesn't yet have any clear plan to improve his position. Short decides to up the pressure on the e-file by preparing a future sacrifice on e5. 29. ♖e4 ♔f7 30. ♖ce2 ♕g4 And Kasparov can't find anything better than to go for an ending an exchange down. Short has managed to weather the storm with some magnificent defence. 31. fxe5 ♕xf3+ 32. ♗xf3 dxe5 Black has an extra pawn for the exchange and soon manages to create threats with his bishops, which need only a move each to get to c5 and f5. Short on time and unable to withstand such pressure, Short commits the decisive mistake. 33. ♖h4? A big blunder that allows the h3-knight to come back to life. 33. ♗g4 immediately would have been correct and led to comfortable positions for Short. 33... ♖xh4 34. gxh4 ♘f4 Suddenly the white king finds itself in danger again, with the black bishops supporting the powerful knight on f4. 38. ♔d1 ♗d7 And Garry doesn't simply take the rook - there's ambition for you! 39. ♖h2 ♗xa4+ 40. ♔c1 ♗xd6 Three mobile pawns are more than enough compensation for the rook, which has no means of activating itself. 41. ♔b1 f5 42. ♗c1 e4 43. ♗h1 ♘d3 44. ♖e2 ♗d1 45. ♖d2 ♗b3 Short could have resigned already but decides to try his chances in time trouble. 46. ♖xd3 exd3 47. ♗d5+ ♔f6 48. ♔b2 a4 49. ♔c3 b5 50. ♔xd3 ♗xc4+ 51. ♗xc4 bxc4+ 52. ♔xc4 f4 53. ♔d4 A magnificent fight from both players, who were playing on a high level until Short's error on move 33 tilted the balance in Kasparov's favour. The blitz games were pure torture for the English player, who was surpassed in all areas by Kasparov. The first game was already a positional mauling. Garry's d6-pawn is a wedge driven into the heart of the black position, with Nigel barely having room for his pieces. On the first day a rusty Kasparov might still have given his opponent some chances to escape, but on day two he was utterly ruthless. In the second blitz game, Short took the bait and fell for a tactical trick from the former World Champion. Nigel couldn't resist: 14.e5 dxe5 15.Qxd7 but now the reply 15...e4! was incredibly strong. The pawn can't be captured due to Rfd8. White had no means of coordinating and withstanding the enormous energy of the black pieces. The best way to watch the game is using our state-of-the-art broadcast, where you can try out your own moves and see engine analysis of them. There's no better way of convincing yourself just how well Black is doing! I think he played very well. Unfortunately chess is a sport and you need energy and that was what was completely lacking in my own game. I felt my energy going down during the match. I just didn’t arrive in good physical condition and had trouble sleeping. I woke up at 2:30 last night and haven’t slept since. It’s about rapid reactions and when you’re sleep-deprived it’s difficult. You’re playing hundreds of points below your level... At some moment I just realised I’m completely gone. He certainly won’t be playing classical chess, but he still understands something about the game… apparently! He’s the greatest player in chess history, in my opinion. He had a much longer reign than Bobby Fischer, though Fischer probably shined brighter for a short period of time. Short didn't use the media scrum over his comments on women chess players as an excuse, though they featured in a lot of internet jokes! Great! I have to confess that I’m also surprised. It was a very difficult day in the beginning. I played quite poorly in the opening and then I just realised that my only chance was to create big complications. The game was hanging in the balance and I think Nigel was better at one point and in the time trouble I managed to win. After this game I felt it was time to play as I played 20 or 30 years ago. Just to have fun and attack, attack. So I did that in every game… and it worked! That’s what made me feel very happy, that I played many very good moves just by hand – as if I’ve been practicing... You see the move and you know that it’s the right move... and I didn’t even need time. All the moves were so natural. All the combinations were just flying around and you just have to make a move to put it on the board. After such an exhibition (in the full meaning of the word) who wouldn't want to see him back at the board again? You want me to be massacred! It’s a very, very different league. Magnus and all the top players – maybe in blitz I can resist. I’ll still probably be losing but in blitz maybe I can resist. In rapid, no way, because it’s too much pressure and I’d have to spend hours and hours and days and days and weeks and weeks and I just simply don’t have time and my mind is not working the same way as before. In blitz probably if I play a blitz tournament with the Top 10 I’ll definitely not be the last one, but I doubt very much I could fight with Magnus or Caruana or Aronian these days. I will fight! It’s about the outcome. Definitely I would give them a good fight for their money. 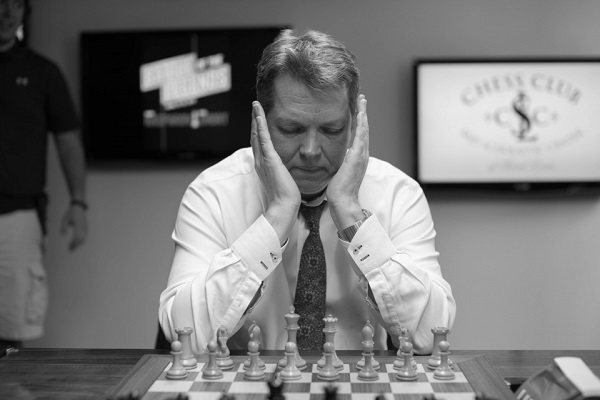 It's unlikely, but in case you're reading this, Garry, if you want to promote chess we can't think of a better way that competing in a blitz tournament with the very best!